The battle over Sheffield's trees all started when the City Council signed an agreement with Amey to manage some of their infrastructure, although the terms in the 7,000 page agreement are secret. As it contains commercially sensitive information Sheffield Council are not revealing the full contents of the 2012 PFI deal (Private Finance Initiative) and even some of those defending it haven't read the whole document. 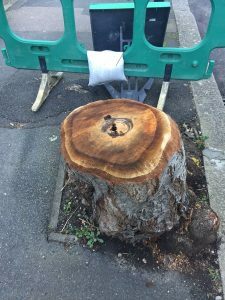 It seems that the contractor, Amey, is planning simply to cut down thousands of the tress and has been chainsawing away since the end of 2016 and has apparently already felled 4,000 deciduous trees with thousands more threatened. According to an independent survey only 1,000 trees of the 36,000 needed to be replaced but the contractors are reported to have said that the trees have to go because mature trees cost more to maintain than saplings and because the tree roots will get in the way of re-tarmacing roads and making other "improvements". Several politicians and celebrities have weighed in with Nick Clegg suggesting this was something you'd expect to see in Putin's Russia rather than a Sheffield suburb. Nick Hawley, of the band "Pulp" and a resident of Sheffield, said that Sheffield City Council had "dropped a colossal bollock". The Green Party politician, Natalie Bennett, described the opposition as strong, determined and widespread and said that though Sheffield is known around the world as "The Green City" it is now becoming known as the city that cuts down trees. Elected politicians and Councils all work for the Public. Unless a situation calls for sensitive material to be kept under wraps such as in times of war then the Public have a right for transparency of all material which directly affect them and the knowledge of any private contract agreement between a private company and the Council should lie in the Public Domain. Britain has the least area of trees in Europe – and is the most populated and urbanized. With so much research and public opinion in favour of tree cover in both urban as well as countryside environment; there must be some serious money and power behind the less than transparent goings on between Council and Contractor. It’s not just Sheffield, here in Staffordshire trees and hedges are disappearing from the road side at an alarming rate. Many mature road side growths have been cut down for no obvious reason. I am not sure who has the contract around. Whatever is happening. I am appalled. 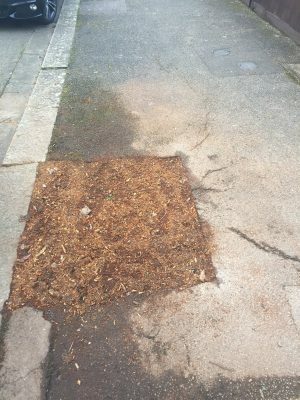 We need more trees planting not cutting them down, and if anyone falls over the unsightly mess the contractor has left behind….more than likely a senior citizen. Come on Sheffield Council lets not play silly beggars, stop this decimation…. Portable woodlands – trees on the move!